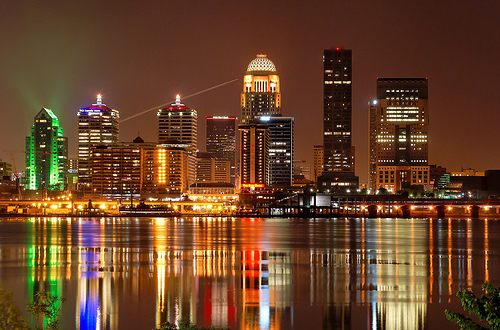 Louisville has worked extremely hard to recreate itself over the last two decades. 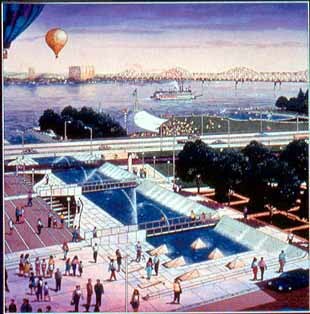 It has remodelled its riverfront, cleaned up decaying buildings, built new facilities like the Yum Center, and in every way tried to make the downtown a pedestrian friendly place. Today, when Louisville throws a party, as it does with the Derby Festival and Fourth of July, or hosts the Ringling Brothers Circus or a great concert, it's worth a visit of several days. With modern hotels and great shopping, there's something for the whole family. 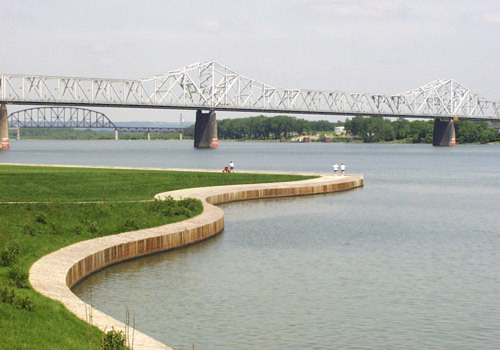 Among its many attractions, downtown Louisville has great restaurants. It has retained its old favorites, and added some cutting edge new ones. Many of its restaurants, in addition to excellent food, offer magnificent views of the river, with paddlewheel steamboats, river tugs pushing coal barges, and locally owned powerboats pulling water skiiers. It's a reasonably compact downtown, so you can leave your vehicle parked and walk everywhere. It's also a safe downtown, brightly lighted and busy most evenings. The most spectacular restaurant is probably Rivue, which is atop the 25 floor Galt House. The floor revolves so the view slowly changes. Try to come early so you can enjoy it in both daylight and dark. Service and food are outstanding. 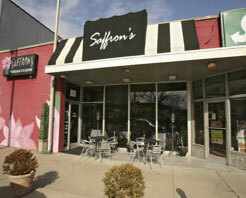 Saffron's is a Persian restaurant with great lamb entrees but a whole menu of delicious items. Do not let the small, squeezed exterior discourage you. The interior is amazingly spacious with tasteful decor. 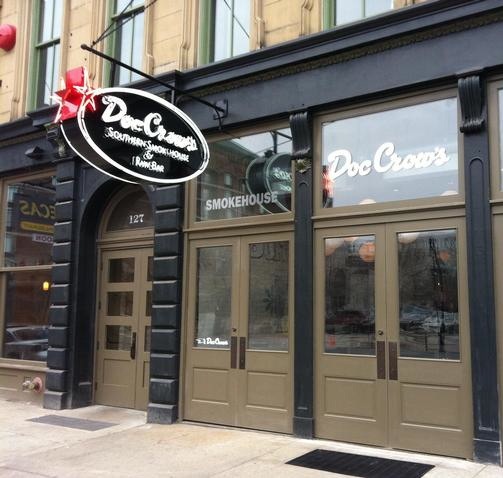 Doc Crowe's is a Southern & Soul restaurant specializing in Barbeque. 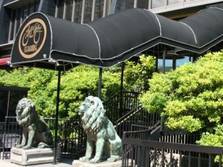 Jeff Ruby's is one of the classier steak houses in Louisville. 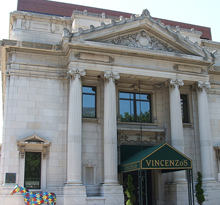 Vincenzo's is, in the opinion of most residents, the best Italian restaurant in Louisville. The building, outside and inside, is beautiful. 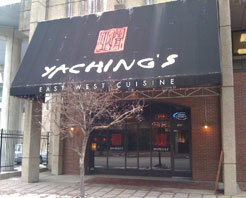 Yaching's East West Cuisine is Louisville's finest example of Asian Fusion. Gumbo's is Louisville's Creole restaurant chain, with one location downtown and five in the suburbs. It offers a very simplified menu : four appetizers, 11 "big bowl entrees," and four Po Boy Wraps. Among the appetizers, we really like the Crawfish Cheese Dip (dark red chili powder, cheddar cheese and crawfish etouffe served with tortilla chips). The stuff is addicting. You'll end up wanting to order a second batch to take home. While we're not big fans of Po Boy Wraps, these are pretty creative, particularly the Chicken Red (slow cooked chicken, Cajun hot sauce, red onions, and celery all drowned in bleu cheese crumbles). The entrees are grouped by heat : four mild, four medium, and three served with a bucket of ice water. If you're just in for a pleasant lunch or dinner, any of the mild choices is fine : Jambalaya (Creole style with tender chicken, sausage, bell peppers, onion and celery), Bourbon Street Chicken (slow cooked in butter hoison (dark soy with a hint of sweet potato, rice, and mild chili peppers) sauce), Garden Creole (shrimp in zesty tomato sauce, golden roux, bell peppers all in white wine), and Gumbo (chicken and andouille sausage, onions and bell peppers cooked for four and a half hours in a deep brown roux). In our opinion, this Gumbo is why you come here. 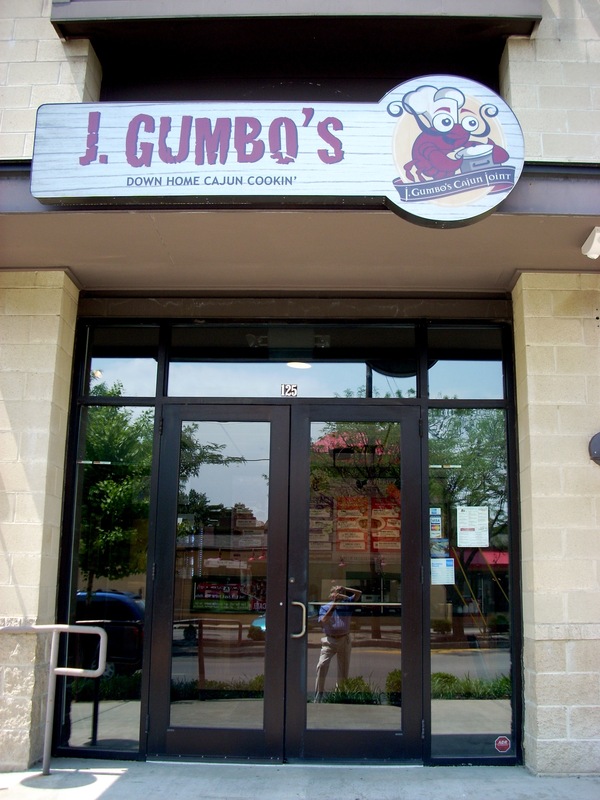 Anybody who names their restaurant "J. Gumbo" better know how to make it, and they do. However, if you want a little more heat, you can step up to the Etouffe (crawfish, chicken and/or shrimp (your choice), onions and celery in their golden roux with a dash of red white and black pepper), Bumblebee Stew (yellow corn, stewed tomatoes, onions and black beans in a sweet and sauce butter sauce), Red Beans and Rice (slow cooked red beans with yellow onions, smoked sausage and Cajun spices on a bed of white rice), and White Chili (Cajun white beans, stewed tomatoes, onions, cilantro, jalapeno and dill). Notice the Bumblee Stew and White Chili are vegetarian. If, however, you consider eating a test of your manhood, you can try the Drunken Chicken (chicken, garlic, olive oil, stewed tomatoes and Cajun spices slow cooked in beer), Voodo Chicken (chicken, spicy Cajun tomato sauce, garlic, crushed red pepper and voodoo spices slow cooked), and the Jean Lafitte (both the Bumblee Stew and Voodoo Chicken topped with cheese and sour cream and wrapped in a tortilla). HOT! !